ADVANCED Runway Refresher, 12-1p Perfect your runway walk at this ADVANCED Runway Refresher, and return to STRUT STATUS just days before LAFW auditions begin. This fast-paced, one-hour coaching session is NOT for beginners. Refresh your audition technique, tip skills, and correct walk blunders all in the same time it will take to watch one episode of Scandal! 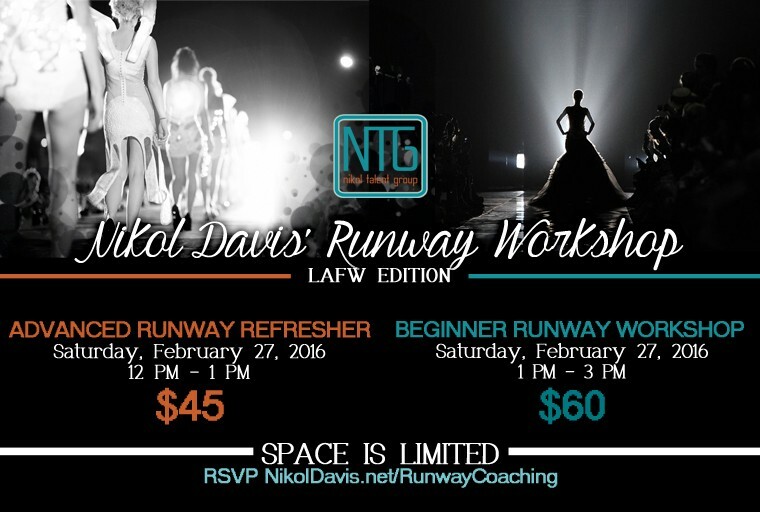 BEGINNER Runway Workshop, 1-3p Sign up for the Beginner Runway Workshop with Nikol Davis, days before LA Fashion Week auditions begin! Learn how to walk with confidence, get great action photos, and have astrong runway presence through specific techniques only taught here! Space is limited, don’t wait… Register here!